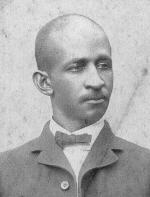 Caesar Carpentier Antoine (1836–1921) was a politician, the third of three African-American Republicans who were elected and served as the Lieutenant Governor of the U.S. state of Louisiana during the era of Reconstruction. He left office in 1877, the last Republican to hold the lieutenant governorship until 1988. That year Paul Jude Hardy, a former Louisiana Secretary of State and a former Democrat, was elected. Antoine was also a soldier, businessman, and editor.